This is a monthly swap series with each month featuring a different fandom theme. You can pick and choose which fandoms to participate in or join them all and have a stocking full of geeky goodies to open when next Christmas comes! This month's theme is Doctor Who! You will be sending your partner one wrapped, Doctor Who themed stocking stuffer and include a tag with your Swap-bot ID and swap name. The stocking stuffer may be either new and unused or good quality handmade and will be sender's choice. Minimum value should be $1 to $3 dollars. Even though you may choose to wait until Christmas to open your package, please rate your partner when it is received. The minimum rating to join is 4.98 with no recent 1's or 3's, no 1's or 3's at all that have not been addressed, and no late swaps on your dashboard. If you have a rating that you would like to discuss, please contact me before joining. I also reserve the right to ban anyone I feel will jeopardize the safety of the swap and enjoyment of the other participants. 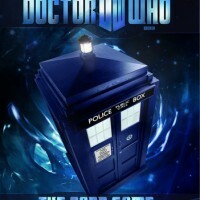 Now that we've got that out of the way, let's start swapping some Doctor Who goodies! Here's a list of some fandoms that will be coming up in the future. If there are any that you don't see but would like to have included, feel free to put your suggestions in the comments and I'll consider adding them to the lineup. Keep a look out for Firefly, Grimm, Harry Potter, Star Trek, DC/Marvel Villians, Supernatural, and Nightmare Before Christmas.